I don't think Samsung will be the winner here. A little while back, The Investor reported that Apple (NASDAQ:AAPL) could shift some of its mobile processor orders away from Taiwan Semiconductor Manufacturing Company (NYSE:TSM) and over to Samsung (NASDAQOTH:SSNLF). The shift wouldn't happen for next year's iPhones, which are expected to feature processors built by TSMC using its 7-nanometer manufacturing technology, but for the 2019 iPhones, according to the site. Such a shift in orders would be a blow to TSMC's leading-edge chip manufacturing technology efforts, as Apple is generally viewed as TSMC's lead customer for new manufacturing technologies. But I think such a shift is looking increasingly unlikely. Samsung has publicly stated that its 7-nanometer technology, known as 7LPP, is expected to enter "risk production" in 2018. Samsung said in a recent press release that it expects to begin "initial production" on 7LPP in the second half of 2018. It generally takes about a year to go from "risk production" to mass shipments, so I wouldn't expect Samsung's 7LPP technology to be ready for mass production until sometime in the second half of 2019. If Samsung were to begin mass production of Apple chips using 7LPP very early in the second half of 2019, then it could have a chance of adequately supplying chips into the 2019 iPhones. That, however, seems like a stretch since, in recent years, Samsung has announced mass production of its new manufacturing technologies late in the second half of a given year. Samsung's second-generation 10-nanometer technology, known as 10LPP , went into mass production back in late November 2017, and parts built using it aren't expected to show up in consumer devices until early in 2018. It's also worth noting that longtime Samsung Foundry customer Qualcomm (NASDAQ: QCOM) is reportedly moving the manufacturing of its next-generation smartphone processor, which will likely be called the Snapdragon 855, away from Samsung and to TSMC because Samsung's 7LPP technology simply wouldn't be ready in time to support the product launch. Qualcomm is, however, expected to use Samsung's 7LPP technology for the follow-on to the Snapdragon 855, which will power flagship smartphones across 2020. Considering that Qualcomm and Samsung seem to have a tighter relationship than Samsung and Apple do -- at least with respect to chip manufacturing -- it'd be rather strange for Apple to adopt Samsung's latest manufacturing technologies before Qualcomm does. 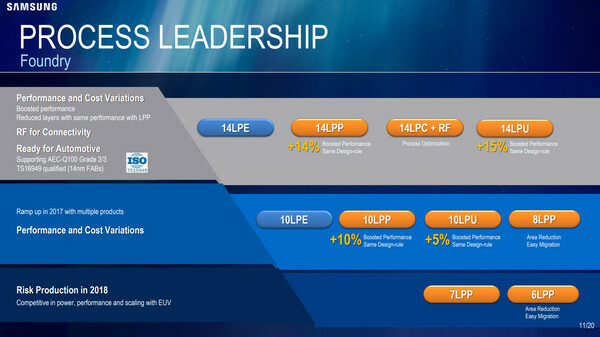 Ultimately, Samsung's 7LPP looks like a technology solution that will go into mass production sometime in the second half of 2019 to support mass product availability in early 2020. Such a schedule simply doesn't look aggressive enough to support Apple's 2019 iPhone launch timing. Apple appears much more likely to use TSMC's second-generation 7-nanometer technology, known as 7-nanometer+, for its 2019 iPhones. 7LPP also appears to be inadequate to support Apple's 2020 iPhone ambitions. Keep in mind that TSMC has stated that its 5-nanometer technology will go into risk production during the first quarter of 2019. This means that it should be ready to begin manufacturing chips using its 5-nanometer technology in the first half of 2020 in support of the iPhones that'll launch in the second half of 2020. TSMC's 5-nanometer technology is likely to offer significant performance, power consumption, and area advantages over Samsung's 7LPP, so the latter simply wouldn't be suitable for the 2020 iPhones. Put bluntly, I think the odds that Samsung wins back Apple's A-series chip manufacturing anytime soon seem low. TSMC is not only a better partner for Apple (TSMC doesn't build competing phones), but it also seems to have a clear lead in chip manufacturing technology over the rest of the contract chip manufacturing industry.